Are you involved in the real estate business? Do you find enough time to manage the clients and update all the data in the systems before it gets too late? Do you find it difficult to juggle the tasks successfully and still be able to beat competition? Are you feeling the heat of the competitors and wish you had an assistant but since your office isn’t big enough you are not hiring one? All of these questions are easy to answer but finding the right solution can be a very difficult task. Being in real estate business is not easy because time is what matters and realtors are always short of time. Hiring an assistant in the office can be a bad choice. It would not only increase your operational costs, but it will also require you to upgrade your office, rent a new one if your office is currently small and increase a lot of other expenses too. 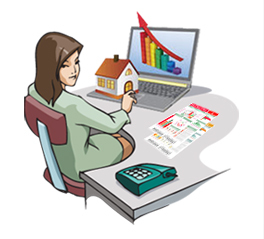 Hence realtors should always opt for a real estate virtual assistant who will do all the tasks a normal assistant in the office would do but without raising the costs. The options with a real estate virtual assistant are many and any realtor big or small can easily afford to hire one according to his budget. If you have never used a virtual assistant for your real estate business before, it might seem like a troublesome task at first. But there are two things you should keep in mind when hiring one and things will be smoother than silk between him and your business. Bear in mind that your virtual assistant is a business owner who is independent and runs his own business which is none other than providing virtual assistance. Hence he is a professional and wouldn’t be treated as someone who knows nothing about the real estate business. It doesn’t matter where your business is located, your VA will handle the tasks easily. He will be your colleague or a partner, so you can be sure that your business is in safe hands and your work will always be quality work. Since your real estate virtual assistant isn’t a regular assistant who would be reporting to your office every single day at sharp at the same time, he would be working from a remote place and you’ll be needed to communicate using email and other services which suit both of you. If you are easy to use these services then working with a virtual assistant would be a piece of cake. This entry was posted on Friday, March 21st, 2014 at 10:40 am	and is filed under Virtual Assistant Services. You can follow any responses to this entry through the RSS 2.0 feed. You can leave a response, or trackback from your own site.